FCC ID application submitted by Sony Mobile Communications Inc for GSM/WCDMA/LTE Phone with BT, DTS/UNII a/b/g/n/ac & NFC for FCC ID PY7-29752M. Approved Frequencies, User Manuals, Photos, and Wireless Reports. FCC ID application submitted by Sony Mobile Communications Inc for Mobile Phone for FCC ID PY7-93041M. Approved Frequencies, User Manuals, Photos, and Wireless Reports. 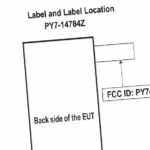 FCC ID application submitted by Sony Mobile Communications Inc for GSM/WCDMA/LTE Phone with BT, DTS/UNII a/b/g/n/ac & NFC for FCC ID PY7-96946K. Approved Frequencies, User Manuals, Photos, and Wireless Reports.